physicians will be able to visualize the borders of tumors more clearly," said Dr. Muriel Ross, director of the Biocomputation Center. The 3-D breast scans were just the beginning of progress inspired by this interagency partnership. The NASA Biocomputation Center is now joining forces with Stanford University experts to form the National Biocomputation Center on Stanford's campus in Palo Alto, California. According to Dr. Ross, "The new center will be a national resource to further the use of virtual reality in medicine." What is virtual reality? It's a computer-created environment that simulates a real-life situation. 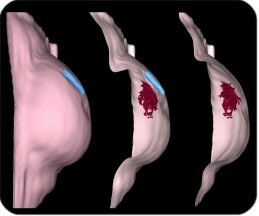 In work related to the 3-D breast tumor-imaging program, the NASA-Stanford biocomputation team also is working on virtual reality tools to aid in complex reconstruction surgery. Surgeons can use a big-screen workbench, special gloves, computer tracking wands, and software to manipulate a 3-D computer image of the patient. In fact, the NASA-Stanford team is now using this technology to work with mastectomy patients needing breast reconstruction and with children needing reconstruction surgery to correct deformities of the head and face. Eventually, the system will be used in other medical specialties and surgical procedures. reconstruction. If the doctor doesn't like the results, it's easy enough to start all over," said Ross. Not only does virtual reality allow surgeons to rehearse complex procedures before an operation, but it's also a powerful teaching tool for medical students. According to researchers, a digital library of computerized "virtual patients" will be created that physicians can use to share information about uncommon procedures. For more information on the NASA Biocomputation Center at ARC, go here. For additional information on NASA technologies being used to detect and treat breast cancer, call the NASA Headquarters Newsroom at (202) 358-1600 or go here.